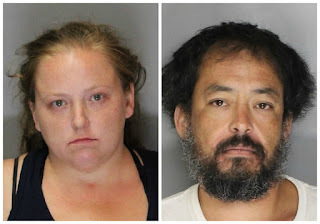 The Sacramento County Sheriff's Department announced the arrests of two suspects this morning in connection to the drowning death of a five-year old child. The two suspects under arrest of the child's mother, 32-year old Jessica Diane Prater, and her boyfriend, 39 year-old Adam Jay Caldwell (pictured above). Shortly after 1:45 p.m. yesterday the Sheriff’s Communication Center received a 911 call regarding a possible drowning of a 5-year old child in the 8700 block of Pershing Avenue in Orangevale. Sacramento Metro Fire responded and located an unresponsive 5 year old child in the residence, and they immediately began life saving measures. The child was transported to a local hospital where he was later pronounced deceased. Sheriff’s deputies were advised the child had injuries that were inconsistent with drowning. Prater and Cladwell were present in the residence during the incident. Sheriff’s Child Abuse detectives responded to the scene to investigate the circumstances surrounding the child’s death. Caldwell is the boyfriend of Prayter, and is not the biological father of the victim. After further investigation, Prater and Caldwell were arrested for felony child abuse causing death, torture, and conspiracy. They were booked into the Sacramento County Jail, and are currently ineligible for bail. They are scheduled to be arraigned in Sacramento Superior Court on June 6, 2016. This is still an ongoing investigation. The identity of the victim in this case will be made available by the Sacramento County Coroner’s office.